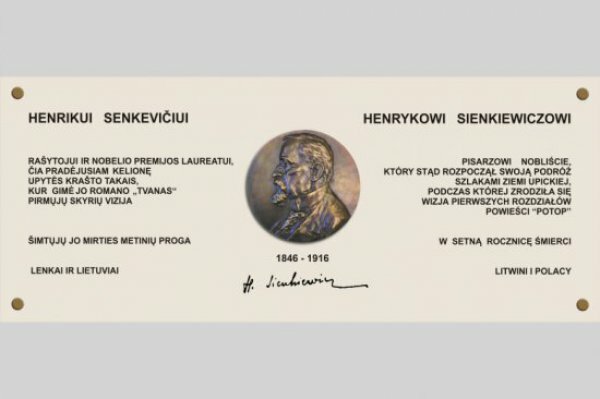 Browse:Home L24.lt To Henryk Sienkiewicz in his 100th Anniversary of the death- Lithuanians and Poles. To Henryk Sienkiewicz in his 100th Anniversary of the death- Lithuanians and Poles. “To the writer and the Nobel prize winner, who here began his journey in Upicka Land trails, during which the first vision of chapters of “Potop” novel was born in his 100th death anniversary- Lithuanians and Poles”- says the caption on the revealed in Bystrampol next to the Lithuanian Poniewież table dedicated to the Polish writer Henryk Sienkiewicz. Bilingual (Polish-Lithuanian) table dedicated to Henryk Sienkiewicz was revealed on the last Saturday at the manor in Bystrampol next to the Poniewież in Lithuania. In this manor the Polish Nobel prize winner was a frequent quest, he was drawing inspiration for his novel “Potop”. During the Saturday’s ceremony occasional letter was read that was directed to the participants of this event by the vice-minister of culture and national heritage of the Polish Republic Magdalena Gawin, PhD. In the auditorium of Bystrampol manor had its place the premiere of the film “Lithuanian trails of Potop” directed by Tadeusz Bystram. The film was made thanks to the support of the National Culture Centre. Guests of this ceremony were such people as: the mayor of Poniewski region Povilas Žagunis, the film producer father dr Rimantas Gudelis, the director Tadeusz Bystram, acting manager of the National Culture Centre Eliza Dzwonkiweicz, and the head of Polish Institute in Vilnius Marcin Łapczyński. Representatives of National Museum in Kielce and its branch Henryk Sienkiewicz Museum in Oblęgorek were present as well, and also the delegation of Lubicz district. On Saturday and Sunday at Bystrampol manor took place celebrations of Henryk Sienkiwicz’s year.